Investors will continue to seek higher returns than will be available on treasury notes and bonds in 2010, providing good demand for corporate debt as the US credit markets return to normal, analysts say. The demand for corporate debt is likely to benefit from the lack of more attractive alternatives amid slow US and European growth, historically low yields and a heavy supply of government bonds, according to fixed-income strategists in New York and London at UK-based Barclays Capital. 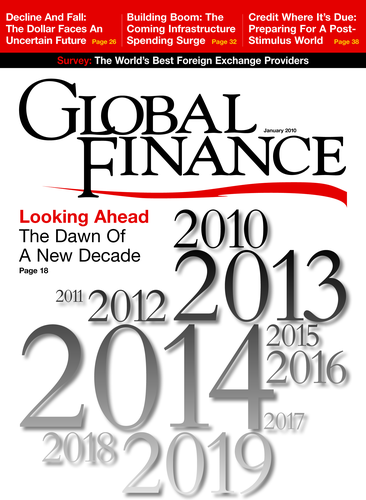 Credit returns in 2010 will be strong by historical standards but lower than in 2009, which will be remembered as a year of epic returns, they say. High-grade US corporate bonds posted double-digit excess returns compared to zero-risk treasuries in 2009, and high-yield corporate bonds had record-breaking total returns (price gains plus interest) of more than 50%. “These returns were driven by the severe dislocation in spreads [above treasury yields] at the beginning of 2009, combined with an aggressive monetary and fiscal response,” Barclays Capital says in its 2010 US credit outlook report. “As we enter 2010, we find that credit is closer to being appropriately priced for this stage of the cycle, with continuing room for normalization,” the bank says. Barclays Capital estimates that 2010 will provide closer to 11% or 12% excess returns on high-yield US corporate debt. Lower net high-grade supply will support spreads and drive investors toward non-traditional supply, such as emerging market corporate bonds, it says. A rebound in mergers and acquisitions this year will be a net positive for high-yield debt, with a greater share of the proceeds of new issues going to support M&A; activity, including leveraged buyouts, the bank says. “We expect 15% to 20% of 2010’s [high-yield debt] issuance to fund strategic and private equity purchases,” Barclays Capital says. The bank expects high-yield supply to total between $120 billion and $130 billion this year, with most of the proceeds going toward refinancing. 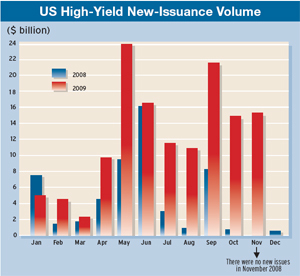 The total high-yield issuance for the first 11 months of 2009 was $137 billion, according to KDP Investment Advisers. Kirkland, Washington-based Clearwire, which is building a high-speed wireless Internet network, tapped the high-yield bond market for $2.5 billion in November through two issues of 12% senior secured notes due in 2015. Clearwire CEO Bill Morrow says the company has now raised more capital than it previously said it needed to fully fund its business plan and will be able to expand its 4G network more aggressively by covering more people, and with more capacity, than it had previously planned. Strategic investors in Clearwire include Sprint Nextel, Intel, Comcast, Google, Time Warner Cable and Bright House Networks. In addition to the high-yield debt, Clearwire also sold $1.6 billion of equity in November to a group of investors led by Sprint.